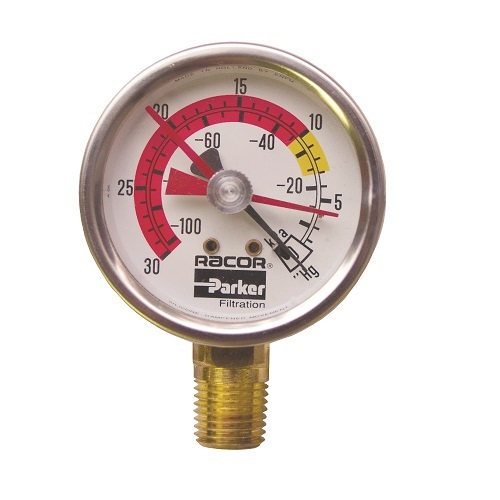 The Racor RK11-1676E in simple form is just the gauge in the Racor RK11-1669. This gauge will replace the T-Handle on top of your Racor 900 or Racor 1000 series turbine assembly. The RK11-1676E is 1/4″ NPT thread to be used in placing in holes that have pipe threads if used by itself say on the doubles or triple assemblies, or plumbed within the fuel piping system, or to replace a broken one. T-handle vacuum gauges available to monitor filter condition. As a filter slowly becomes clogged with contaminates, restriction (resistance to flow) increases. Because of this restriction, more air is mixed with fuel and less fuel is delivered to the engine (fuel de-gassing). This will result in loss of power and eventually stall the engine. Installing a T-handle Vacuum Gauge in your fuel system gives you a visual monitor of your filter condition. Excessive resistance on the gauge means it’s time to change the filter.